The Heath, Photographs by Andy Sewell. Published by Andy Sewell, 2011. Andy Sewell, London, 2011. Hardbound. 84 pp., 39 color illustrations, 11-3/4x9-1/2". It is on rare occasion that one opens a book of photographs reflective of a specific place that speak softly to a personal journey of subtle meditation, while at the same time contains imagery so moving as to leave the viewer contemplating their own experience. This is where I found myself after quietly absorbing the images in Andy Sewell's self-published book The Heath, pondering a personal sense of place and considering my own ideal of solitary reflection. The Heath is a book that suggests the notion of an eloquent withdraw. It is also a book about a place, the Hampstead Heath, an ancient park located at one of the highest points in London. It is a place seemingly buried deep within the urban surroundings of the English city and exists as a wild but managed landscape. Naturally captivated by the Heath, Sewell spent five years losing himself in this hybrid expanse, creating a series of photographs that have uncovered the subtle beauty of the terrain, as well as his personal maturity in photographic approach. The Heath, by Andy Sewell. Published by Andy Sewell, 2011. The photographer's intelligent portrayal of his subject isn't for the casual viewer, but rather for those who appreciate the challenge of consuming the complexities a powerful narrative provides. While turning the pages of The Heath, there comes a striking realization that Sewell's withdraw into the dense forest and tall grasses never fully provide the photographer with full seclusion. There is always an element of intrusion in these photographs, an intrusion that is often so delicate as to be easily overlooked. A distant light or scatter of birdseed seems insignificant, but in this book it is the subtlety of the imagery that gives weight to the series. At times the photographer shares a glimpse of the Heath's popularity. An open field - designed to accommodate dozens of dog owners and picnickers - appears from the shade and solitude of the forest trees. It is as if while on an isolated path, Sewell stumbled upon another reality for those who enjoy this controlled environment. Operating within the limitation of a self-published book, Sewell creatively pre-sold 89 limited edition copies that led to the funding and publication of this title. By doing so, the photographer managed to produce an object that is beautiful in design. 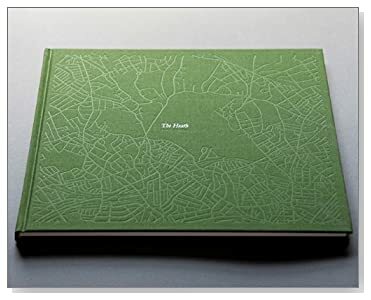 Imprinted on the cloth cover is a subtle map of the urban habitat surrounding the Heath, giving a context to the broader environment and importance to the management of public lands provided by the city of London. The exquisite end-papers and stunning printing further elevates this object and serves as an inspiring model for those seeking self-publication. Antone Dolezal is a New Mexico based photographer and writer. His photographs have been exhibited and published nationally and are held in several private and public collections. His writing contributions have appeared regularly in various photographic publications, including Finite Foto, photo-eye Blog and photo-eye Magazine. Antone studied photography, art history and writing at the College of Santa Fe, receiving his BFA in 2006. These are not pictures of "Heath" but rather of forest and moor. But I guess an artist can call an elephant a suitcase if he wants to. The piece of land photographed in this book is officially called Hampstead Heath, known colloquially as "the Heath," as it is also referred to in this book. I imagine that the land was originally a heath but, over hundreds of years of cultivation and subsequent land management by the City of London, it has been transformed.